The treatment of choice in particular for larger tumours is Mohs surgery. In the case of deeper infiltration of the subcutaneous tissue, the preservation of the first branch of the facial nerve is not always possible to achieve a R0 resection (complete removal with tumour-free excision margins). In these patients, upper lid ptosis and/or brow ptosis may develop after surgery. The correction of resulting functional impairment, especially of the lateral view, has priority. Aesthetic considerations should support the rehabilitative approach. 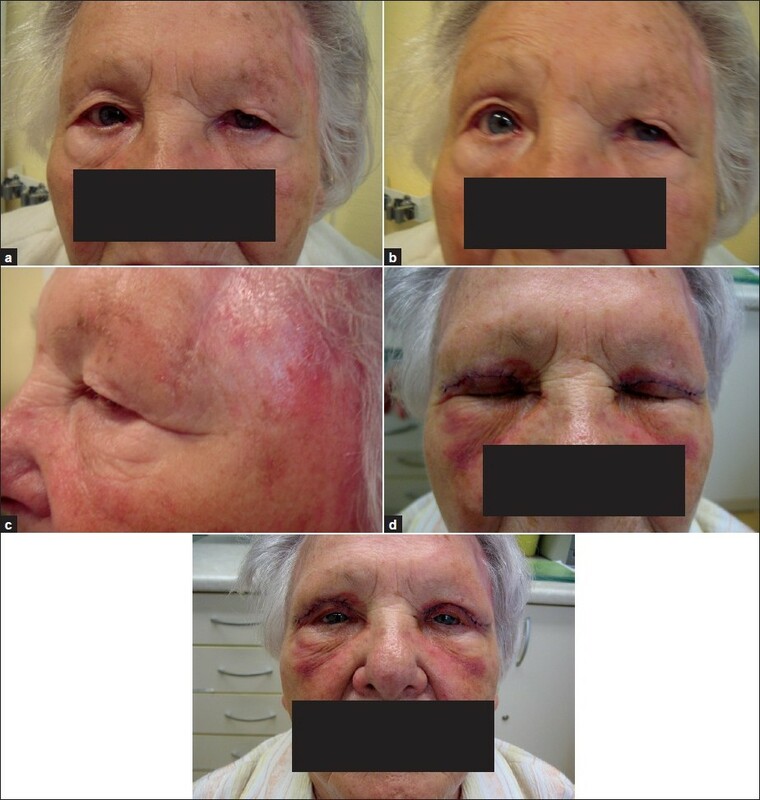 Since most patients are elderly with significant dermoheliosis of facial skin, often dermatochalasis and significant comorbidities, the procedures should not add another significant risk. A 61-year-old male patient presented with a large and deep infiltrating BCC of the left temple. After Mohs surgery, wound healing was unremarkable. However, a combined brow and upper lid ptosis had developed and hampered his lateral view [Figure 1]a. On the other hand, he needed his car and so rehabilitative surgery was planned. Since he had a blepharochalasis, we used a combined approach, i.e. blepharoplasty of the upper lid and direct brow lift. The procedures were performed under local anaesthesia. Because there was no prolapse of the adipose tissue, a simple skin resection of the upper lid skin was performed and sutured with 4-0 Prolene (Ethicon, Norderstedt, Germany) sutures. For the brow lift, an elliptical incision on the apical border of the brow was performed [Figure 1]b. The height of the incision was measured before by pulling the brow to its intended height and marking the position. After the removal of skin, the deeper layers were carefully removed down to the insertion of the insertions of muscle fibres of the venter frontalis. The vessels including the arteria conjunctivalis posterior were carefully preserved. We deepened the lateral part to the areolar tissue superficial to the periosteum. The skin adjacent to the incision borders was loosened by blunt preparation to ensure a tension-free suturing. The frontalis muscle was resected and the ends were sutured by 4-0 PDS (Ethicon) sutures to position the brow [Figure 1]c,d. Wound closure was done by suturing the subcutaneous tissue with deep knots (4-0 PDS) and final wound closure with cutaneous 4-0 Ethilon (Ethicon) sutures [Figure 1]e.
After the removal of the suture, we recommended a preventive topical scar treatment (Cicaplast® ; La Roche Posay, Asnieres, France). There was no significant scarring or other late adverse effects. The patient was very pleased with the outcome. An 86-year-old patient presented with a large SCC in the left fronto-temporal region. Mohs surgery was performed and wound healing was unremarkable. Four weeks later, she presented with a mild brow ptosis and an upper lid ptosis combined with blepharochalasis [Figure 2]a-c.
She did not want to have a correction of the brow but the upper lid. In this case, we performed blepharoplasty under local anaesthesia. After the resection of the upper lid skin with a monopolar radiofrequency tip (Ellman TM device [Ellmann Int., Oceanside, NY; USA], "cut and coag" mode), conservative fat pad removal was done by the incision of the medial and central septum. The wound was closed with running sutures with 4-0 Ethilon. Preventive topical scar treatment was recommended (Cicaplast® ; La Roche Posay). The patient was pleased with the outcome during the follow-up period of 2 years [Figure 2]d-e.
As long as the R0 resection is the primary goal of treatment, the preservation of facial (or other) nerves is not always possible. Therefore, we need rehabilitative tools to deal with post-procedural palsy. The use of simple but effective procedures that will not add an additional risk for the multi-morbid patients is our practical approach. Under this view, the direct brow lift is a very useful technique. We use a modification with suturing the frontalis muscle to obtain a significant lifting without placing any tension on the cutaneous sutures. A necessity of the technique is the careful avoidance of the dissection of the supraorbital neurovascular bundle. Other adverse effects are rare and manageable. To ensure an aesthetic scar, preventive topical treatment by appropriate scar ointments or gels is recommended. They way of dealing with post-surgical palsy has to be discussed with patients to identify their needs and complaints. Keeping it simple often is a good compromise between the attempts of the surgeon to be (almost) perfect and the reality of the patient. 1. Leiter U, Garbe C. Epidemiology of melanoma and nonmelanoma skin cancer - the role of sunlight. Adv Exp Med Biol 2008;624:89-103. 2. Wollina U, Pabst F, Krönert C, Schorcht J, Haroske G, Klemm E, et al. High-risk basal cell carcinoma: An update. Expert Rev Dermatol 2010;5:357-68. 3. Stang A, Strausberg J, Boedeker W, Kerek-Bodden H, Jöckel KH. Nationwide hospitalization costs of skin melanoma and nonmelanoma skin cancer in Germany. J Eur Acad Dermatol Venereol 2008;22:65-72. 4. Meltzer NE, Byrne PJ. Management of the brow in facial paralysis. Facial Plast Surg 2008;24:216-9. 5. Booth AJ, Murray A, Tyers AG. The direct brow lift: Efficacy, complications, and patient satisfaction. Br J Ophthalmol 2004;88:688-91. 6. McCord CD, Doxanas MT. Browplasty and browpexy: An adjunct to blepharoplasty. Plast Reconstr Surg 1990;86:248-54. 7. Cohen PD, Reiffel AJ, Spinelli HM. Browpexy through the upper lid (BUL): A new technique for lifting the brow with a standard blepharoplasty incision. Aesthet Surg J 2011;31:136-9. 8. Georgescu D, Anderson RL, McCann JD. Brow ptosis correction: A comparison of five techniques. Facial Plast Surg 2010;26:186-92. 9. Damasceno RW, Cariello AJ, Cardoso EB, Viana GA, Osaki MH. Upper blepharoplasty with or without resection of the orbicularis oculi muscle: A randomized, double-blind left-right study. Ophthal Plast Reconstr Surg 2011;27:195-7. 10. 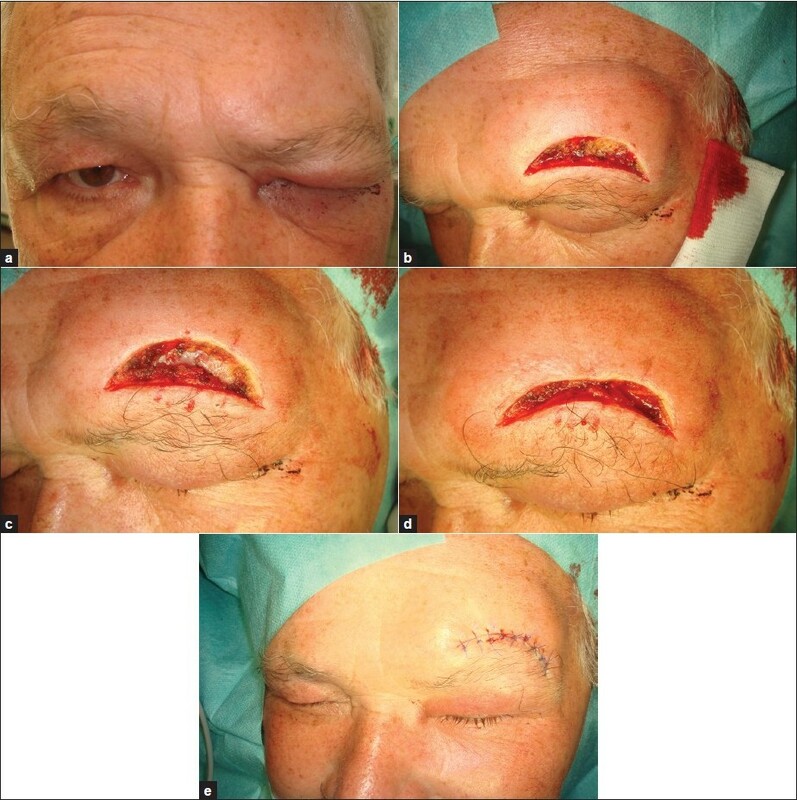 Naik MN, Honavar SG, Das S, Desai S, Dhepe N. Blepharoplasty: An overview. J Cutan Aesth Surg 2009;2:6-11.